Shower of Roses: More New Products at Catholic Artworks and a Giveaway! More New Products at Catholic Artworks and a Giveaway! Here at Nippert & Co Artworks, we are proud to present to you our full line of Look & Learn Catholic Visuals! Check out our website to see our exciting new line. With 52 sets to offer, there is sure to be something for everyone – Elementary level, Teens and many set available in Spanish! These high quality visuals are printed on durable 100# Glossy cardstock that will allow you to create a colorful classroom environment while teaching the basics of our vibrant Catholic faith! The price is right too, our special introductory prices will go until the end of the month – Please check it out & tell us what you think! Please help us my forwarding this to anyone you think may be interested! Thank You! Click here to see our full line of Look & Learn Catholic Visuals! I know I have mentioned Catholic Artworks before, but since we love using some of their products on a weekly basis (particularly with the Alphabet Path), I thought it would be fun to host a giveaway in an effort to help them spread the work about their new products. All you need to do to enter is leave a comment with your contact email and tell me which of the new products is your favorite. There is SO much to choose from, but I think my favorites are the St. Therese - God Bless our Little Ways kit, the Alphabet of Saints Border, and the May Crowning kit. Hubby's favorite was the larger size of the Vessels & Vestment cards since he thinks they'll be great to use when training Altar boys. I also really like the idea of Father Nick, especially since we have never gotten around to making our own, but with three brother-in-laws in the FSSP, I'd LOVE to see a traditional version with Fiddleback vestments perhaps... Wouldn't that be neat!?! Anyhow, go and take a peek and then come back and leave a comment. I will close comments Sunday afternoon (March 14th, Rose Sunday!) and then draw a name. The winner will receive a set of Catholic Artworks Vessels & Vestments Flashcards (perfect to include in an Easter Basket!) and one of my Hand-painted Wooden Saint Therese Dolls. I like the alphabet of saints border, too. I also like almost all of the classroom card sets -- I am BIG on flashcards around here -- they are such a great learning tool. Ooh, I love the stations of the cross for children cards (my little one is just barely figuring out that it's different from Mass) and the mysteries of the rosary cards. (I guess my favorite thing is a tie :>)) Thanks for the chance! I like the May crowing set too - as we don't have a crownable statue. But the rosary mystery cards and the beatitude set look very good too. There's so much there I could talk myself into buying! I love all the products, we bought a years worth of art from this company two years ago. What an amazing family! I love Father Nick and his vestments! Swell, another wonderful new company (to me) whose products I am sure I NEED! Do you subscribe to the Creative Catholic or Teachers Helper? Would you suggest one over the other? I am new to these products, but they look great! Thanks for the giveaway. Where to start?? I love the Alphabet of Saints, but I love the St. Therese kit, too... and the Ten Commandments kit... and the Good Shepherd kit... I will definitely have to keep these in mind... Thanks for introducing us to this company and for having this giveaway! Wow - Looks like they have some great new stuff....I can only pick one?! Well, seeing as it's lent, I'll have to go with the Lent/Easter Banner Kit. Thanks for posting this great resource! Father Nick and his vestments are a great idea. It could help my little guys to pay attention more to the mass (tell me after Mass what color of vestment Father was wearing). We really like the mystery of the rosary cards and pull a mystery out each day when we pray family rosary. It helps our two boys understand more what decade we are praying. I really like the Fr. Nick paper dolls but everything on the site was great! Thanks for sharing! For those of you that don't have your emails linked to your profiles, please remember to include your email address so I am able to contact you if you win. Thank you! Love your blog! I'm partial to the Good Shepherd Beatitudes set - what a good theme for my boys. I can't decide! Love the St. Joseph kit which would be used next week, or the Lent/Easter banner :) Thanks! It's hard to decide - but I think I have to go with the May Crowning set and the Vessels and Vestments. I like the Gifts of the Holy Spirit images. Beautiful artwork! 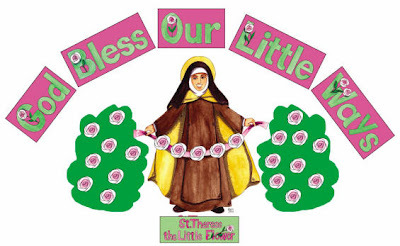 I love the St. Therese God Bless Our Little Ways! I agree, traditional vestments would be nice. I like the Alphabet Saints Border and the Next Concept Cards - Gifts of the Holy Spirit. My favorite is the alphabet saint border. Thanks! Oh, how great,,,I love the st. therese one too I think. I like the Alphabet of Saints border the most. I love the St. Therese kit! What a great idea!! I also like the Alphabet of Saints border. It all looks great. I have never bought anything from them. Thanks for the contest. Thank you Jessica, I love their products. I just got the teacher's helper (after you posted about their sale...many thanks). Wow! I like them all. I love the St Therese set and the May crowning set and the God Bless America set as well! Thank you for hosting this give away and sharing your ideas! Just lovely! I'm putting this company in my homeschool file:) I think my favorite is the Alphabet of Catholic Saints with the St. Therese Kit in a close second. God Bless! My favorites are tied between the May Crowning kit and the Fr. Nick's vestments. They have so much cool stuff! My favorite is the Lent/Easter banner. Perfect for an uncrafty person like me! I love the 10 Commandments and May crowning kits. Thanks so much for introducing me to this wonderful company... I placed an order around Christmastime and it looks like I may be doing so again soon! Your blog is such an inspiration for me to continue homeschooling! Thank you for letting us know about Catholic Artworks. I like their alphabet of saints border and the Lent/Easter banner kit. It looks like I will be frequenting their website often to purchase their wonderful products. This is so neat Jessica! I love Catholic Artworks! Thank you Jessica! The vessels and vestments cards look great especially since my son loves to be an altar boy. Thanks for all your helpful tips and ideas. God Bless and thanks for inspiring me on the 40 day challenge! Jessica, you are sweet to do a giveaway.! I have been using Nippert catholic artworks for a few years now. I love their pictures. I like the wall Stories for the saints. I love your wooden saint dolls too. So talented. Thanks for participating in the Favorite Fives! I think the Saints and Vessels cards would help us out since we have a house full of boys and 2 so far are serving the TLM. All of the artwork is very nice and I wish I could buy up a ton of stuff from the website. Thanks! I love the printable holy cards Faithkeepers Collection - I ove being able to use them the way I want. These look really wonderful--though, like you, I really wish they had some sets that were more fitting for the Traditional Latin Mass. It's so hard to find these kinds of resources for us Latin Mass-goers. But I do love the look of many of the sets. What a great resource! Fr. Nick and his vestments! What a wonderful, hands-on way for children to learn and remember colors of liturgical year. Certainly brings about a greater awareness-especially during mass. Hi Jessica,I have just found your blog, I think it's wonderful. I want to thank you for sharing your faith & lives with us in blogland...lol...& thankyou so much for telling me about Catholic artworks. We live on a farm in Australia & I have never seen anything to the likes of what they have here...I love it all....we need it all....LOL...We have 10 Children & I hope & pray everyday that they grow strong in their faith. Living in such a small community & being the only practising Catholics here can get quite hard at times so I thank God for leading me to your blog. 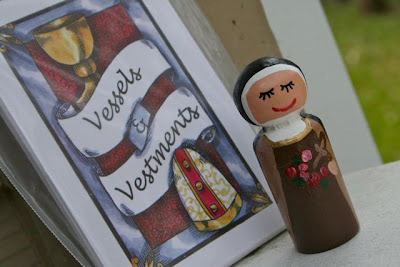 Oh & I love your handpainted St Therese wooden doll...do you sell these? So hard to decide... We have gotten a lot out of the Alphabet CD and the Rosary CD around our homeschool. My Little Flower Girls (We are up to 9 now! )would love to have the Saint Therese or the May Crowning Sets to work with in our upcoming meetings. Fr. Nick and his Vestments looks very fun! I would love the visual rosary cards. I think that we would get a lot of use out of them. Thank you for spreading the word about that site. It looks really neat. Personally I am very fond of the Alphabet of Saints and find it a lovely visual for children to gaze upon. :) Agreed on Traditional vestments and also including black vestments in the selection. Would LOVE to see that actually. I like the Good Shepherd's Beatitude Kit. Thanks for sharing about this beautiful company. My favourite is the Alphabet of Saints Border and the May crowing set and the Good Shepherd kit too.